As soon as I starting earning an allowance, all of my money went towards books. At the time, I was obsessed with four book series: The Babysitters Club, Boxcar Children, Nancy Drew and Sweet Valley High. I’d plow through them quicker than my parents could get me to Annie’s Book Store (our local book shop) and would often choose getting lost in a book over anything else. I can remember my mom calling up to me that it was dinner-time and — even with all my love of food — sometimes it would take me a while to get to the kitchen, I was so enamored with a book. I still love to read, though I can’t tell you the last time I read a book that wasn’t a pregnancy/parenting-related book! And though we didn’t read a story to Maya every single night early on, it’s something I think is really important. We want her to love reading as much as her mommy and daddy do, so we’ve been reading to her more and more — though not always at bed-time. Well, the past two weeks something new has happened in our home: Maya’s love for reading has officially been born, and I can’t stop kvelling about it. Whereas she just used to systematically throw her books off the bookshelf and then, when we’d try to read to her, she’d flip the pages — barely letting us read a word — she now will go to her bookshelf, thoughtfully choose a specific book (she has four favorites at the moment — all touch/flip books) and bring it to me. Then she will make a grunting sound (her version of “Here, read to me, woman!”) and clamor to sit in my lap. She nestles in and we read. 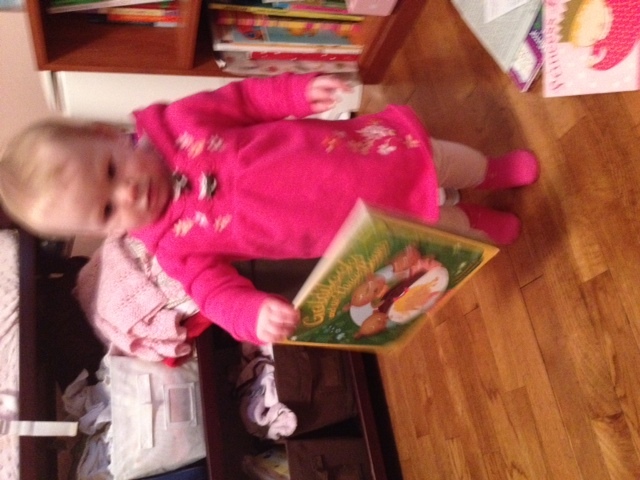 Or, rather, I try to read while she still flips the pages to find the fun open/flip/touch/aspect on the page. Point is, it’s a deliberate act now, something she is choosing to do. It’s seriously the sweetest thing. I’ll be arranging something in her room and she’ll lug a book over and practically wave it in my face … and I stop whatever I’m doing to sit with her and read. We have read the same book 900 times in a day now, it seems, but it never gets old for her and I want to savor these moments because I know she will be 13 someday and want nothing to do with me. This weekend in New Jersey, she did the same thing to my parents and my sister and it completely warmed my heart to see her crawl into their laps and allow them to read to her. And with that, she melts my heart. Yours and mine both, Janelle! It’s amazing how such a tiny action (i.e., reading) can be so meaningful.